The Brushliners come in a range of 3 grey shades - Light, Medium and Dark Grey and Black and have a fabulous brush nib that can create very defined lines or braoder strokes depending on how much pressure you apply. Ideal for drawings, cartoons, manga-style artwork, Oriental calligraphy, Zentangle etc. 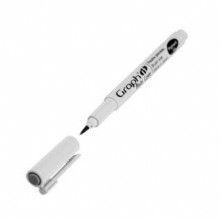 The brush pens have waterbased pigmeted ink that is lightfast, waterproof and erase resistant. They are acid free and photo safe and are made in Japan. The black ink is a jet black ink. When used with Alcohol markers they do not bleed. Click the button below to add the Graphit Brush Liner - Dark grey to your wish list.